Most cities of any size had the "Downtown" or business section and in each business section was a minimum of one department store. 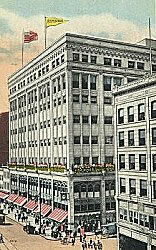 Newark always seemed to have at least three department stores but only one was truly a department store, Bamberger's. Bamberger's, or Bams as it was commonly known, was a true department store. It had eight selling floors, elevators that were run by elevator operators wearing white gloves and of course floor walkers. In addition to the usual departments found in so called department stores, today there were departments devoted to books, toys, sporting goods, furniture, electronics, notions, stationary, food, yard goods and oh so many more. One could easily spend several hours just going through the store. If you happened to be in Bams at meal time you went to the floor with the food department. There were usually several demonstrations going on showing how certain foods were to be prepared. Following the demonstration, the food that had been prepared was distributed among the spectators. The favorite department of my gang was the toy department. We were fascinated by the chemistry sets, erector sets, microscope sets, telescopes and the always popular electric trains. There was usually a demonstrator in the toy department showing all the wondrous things that could be done with a particular toy. When a toy demonstration ended it was down to the food department for some more freebies. Outside of Bams was a large clock from which the time could be seen from any of four sides. This was known as "the Bams clock" or sometimes just "the clock". A popular meeting place was "under the clock." There was a saying in Newark If you stand "under the clock" long enough eventually you'll see everyone you ever knew. In the late 30's or early 40's Bams became a part of the Macy's chain. Kresge's department store was the closest thing to another department store Newark had. It was no Bams nor was any store before, during or since.